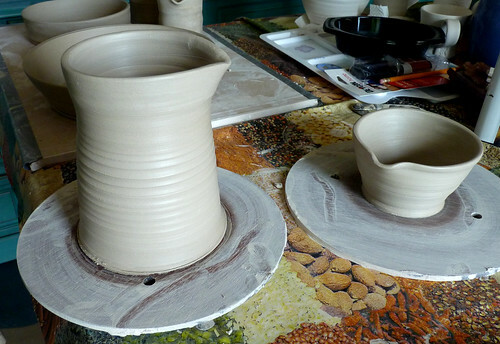 Tableware progress – bigger dishes! I decided not to throw anything until I glazed some pieces and made a bit of room in the studio, but the other day I slipped out to have a look at something in the studio and it just happened! 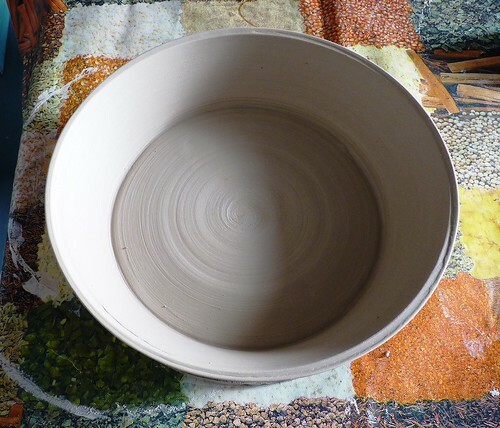 Out came the clay and I wasn’t seen again until I had made some serving bowls. For some unknown reason things seemed to just work. 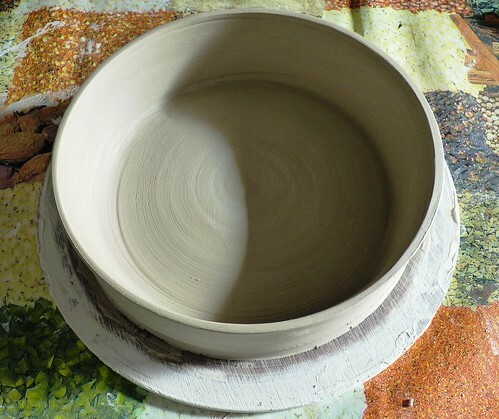 Centering was much easier, I even centered two balls of clay on top of each other to make a large serving platter. It’s as wide as I can go on my batts, the biggest thing I’ve thrown to date and perfect for roasting vegetables. Then came a straight sided dish that will fit in the halogen cooker. They still need a bit of trimming but I have left them on the batts a little too long so instead of wiring them off I’m hoping, like my plates they just pop off as they dry. 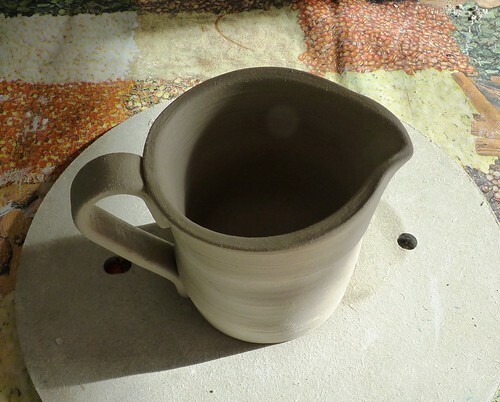 I made a little jug too. 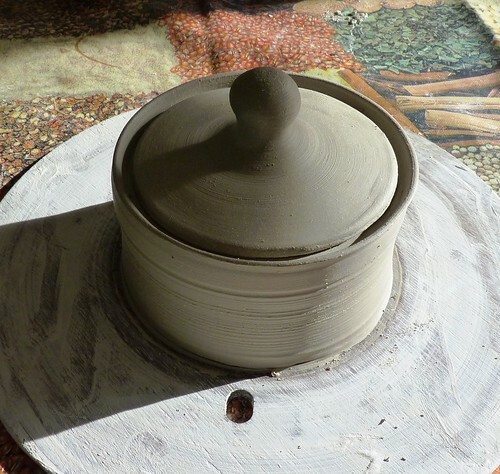 And a lidded pot, with a gallery and a knob on the lid, I was on a roll. The problem was I should have let them get leather hard first. So half a day later I had managed to get them apart, but the lid was reduced in size with all the trimming and I messed up the gallery, which I fixed. The lid is a little slack now but there is the thickness of the glaze to consider, and at least it doesn’t fall inside. I’m continuing glazing, but I admit it’s not my favourite thing to do, I may have shown these already, forgive my excitement but my pile of dishes is growing. 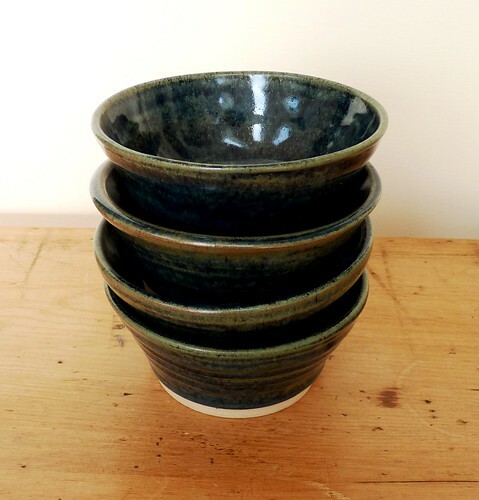 We have eaten off them too, the large bowls are perfect for a hearty soup, noodles or porridge. 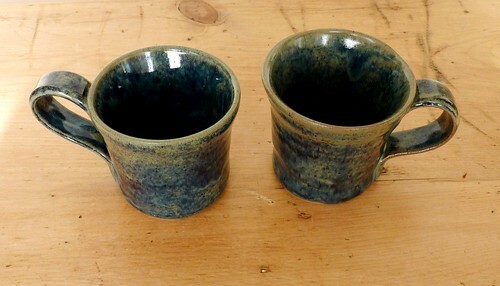 The mugs are smaller than I like but they are fine for an after dinner coffee, I can make some larger ones eventually. I did have an issue with the glaze running onto the batt on a couple of mugs so I will have to try and grind them smooth, fortunately I made 2 spares of everything. The plates have stayed flat, no cracking or warping, but they are more of a breakfast plate than a dinner plate, maybe I should call them weightwatcher plates. Then there’s my small dessert bowls, maybe too small, but ok for ice cream, fruit or yoghurt. 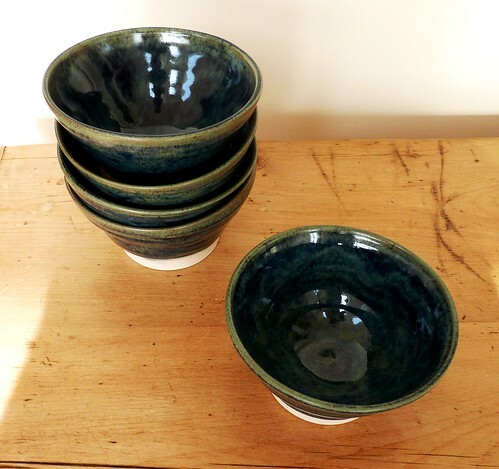 I have my fingers crossed for the serving bowls, I hope they come off the batts soon, and as for the rest of the glaze firings , no more runs please! 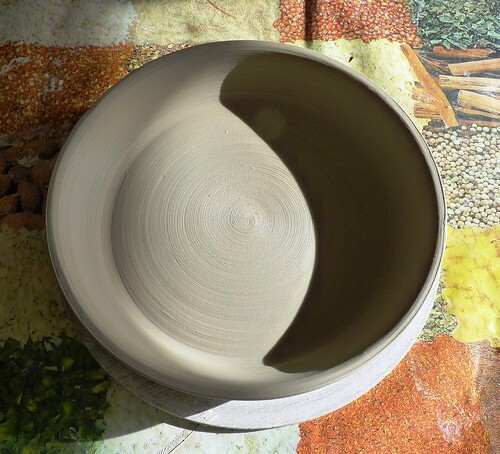 This entry was posted in kiln fired art and tagged beginners ceramics, ceramics, kiln fired art, serving bowls, tableware. Bookmark the permalink. 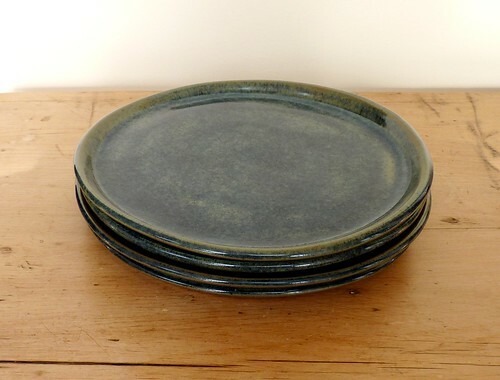 3 Responses to Tableware progress – bigger dishes!